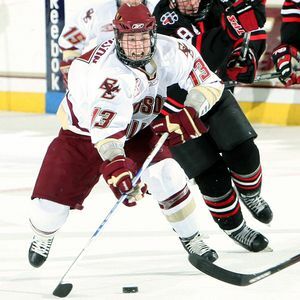 Boston College junior forward Cam Atkinson will forego his senior season at Boston College after signing with the Columbus Blue Jackets on Sunday. Atkinson, who led the nation in goals as a sophomore, is a Hobey Baker Award finalist this season. He scored 52 points, including 31 goals. His season ended when Boston College was eliminated from the NCAA Tournament on Friday with a 8-4 loss to Colorado College. Atkinson was selected by the Columbus Blue Jackets in the sixth round (157th overall) of the 2008 NHL Entry Draft.